Money in the Garage: The North Face Jacket is everywhere ! a little birdie says to check out Miss Me Jeans. Easy $50+. Wow-Wee,just looked them up on eBay! Looks like this spring I'll be in search of these money makers. I know just the "Pottery Barn" neighborhoods in my town that would have these on their garage sale tables. Ha! Boy, it sure is great to read your tips. When the garage sale season comes, I am going to keep an index card in my purse,listing everything I should be looking for. That will really help me to zero in on stuff. Thanks! I hope you find some of the stuff I've recommended. That's why I encourage folks to write in with their tips too-the comment section can serve as a garage sale tips bulletin board! Speaking Of NorthFace, was gassing up my truckster at the local gas station this afternoon. The kid pumping gas was wearing a NorthFace! Seems to me that NorthFace jackets cost a lot of money, don't know if I'd want my kid wearing his nice expensive coat while working at a gas station. But maybe that's just me-Ha! But once again...they're everywhere! Thanks for writing in and appreciating the blog...Dude! I have noticed the same thing. I haven't been able to find any NorthFace items yet in the thrift stores though. I did find a Columbia coat, but my son wanted that, so it didn't go on ebay. Columbia items go well also! CindyLou - Absolutely, Columbia is nice too. Sort of from the same genre along with LL Bean, Orvis, REI and the other outdoor clothing lines. Hope you find some NorthFace, they definitely are not easy to come by. 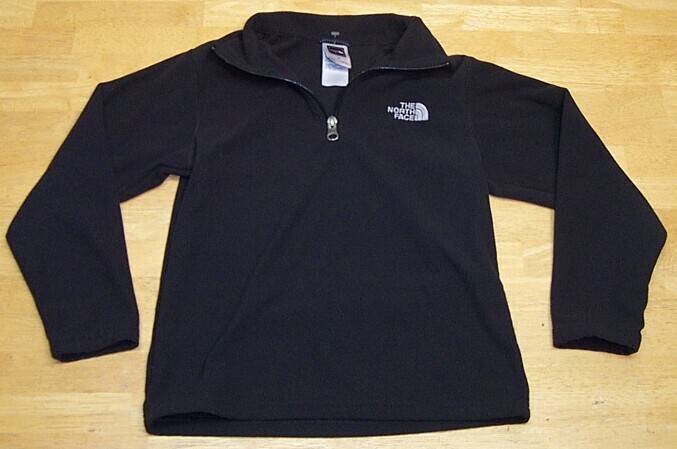 I have found and sold a decent amount of North Face Jackets. Most come from the Goodwill Outlet..so I only have a $1 or so invested. Found a kids one this week at a thrif store for $3. However, this week there is someone on a FB group selling "designer inspired" jackets. I've heard that this is a highly "faked" brand, but never personally seen it. The fakes were decent, but I could tell a few things were off. But, only because I've sold them in the past. Now I'm really leary :/ They are however a great sale and a wonderful brand. I love my personal North Face stuff. Kim-A dollar for anything NorthFace is a steal! That's awesome. Finding them in the thrift stores around her is somewhat of a rarity, but there's always the garage sales. Your comment about wondering what your daughter's jacket would sell for on Ebay made me laugh. I do the same thing with my daughter! I tell her don't scuff those Stride Rites up, that's big money on Ebay! Since I mainly sell shoes on Ebay, I catch myself staring at everyone's shoes all the time. I will have to start looking for North Face stuff when I am thrifting too. Gail-Ha! I am glad to hear I am not the only one! About two years ago I wrote a piece about my Princess throwing her used Uggs in the trash! I was like...what?!? I retrieved them and sold them for around $35 bucks. For sure, watch out for that NorthFace and thanks for writing in...Dude! A panhandler wearing a brand new looking North Face jacket and Nike shoes approached me recently and all I could do was say,"Are you kidding me?Your jacket is nicer than mine." Spymay-Ha! That's crazy, right? Styling panhandler....Too funny! beckyp- I hate when they jack up the prices for a name brand. Along those same lines, one of the GW stores in my area segregate out the "new with tags" shirts on a separate rack and charge more for them! Annoying,because the other GWs in my are don't bother to do that. NYDJ too? Hmmm, okay thanks for the tip....Dude! Samantha-Don't ya hate when the thrift stores hike up their prices on name brand stuff? They take the "thrift" out of it when they do that! Very frustrating! But great idea selling on CL instead of eBAy...no fees or shipping, nice! Thanks for writing and for the tips on REI and related gear...Dude!